In recent seasons Empoli of Serie A have built something of a reputation for the development of talented central midfielders from the young Argentinian regista Leandro Paredes on loan from Roma to the Polish midfielder Piotr Zielinski they have played a large role in the coming of age of both young players. Whilst they had success taking players on loan and turning them in to first team regulars they seem to be repeating the trick this season with the young Senegalese midfielder Assane Diousse. Primarily a defensive midfielder comfortable at the base of the Empoli midfield Diousse has impressed with his tactical maturity in a difficult campaign for the Tuscan side. As well as being defensively solid and tactically astute enough to cover the area in front of the defensive line he has also impressed with his ability to contribute to the attacking phase with an ability to always show in support of the man in possession and to either play the simple ball to shift the emphasis of the attack or look to play vertically through the opposition lines. Diousse is also physically imposing with the capacity to drive forward from the base of the midfield in possession of the ball. In short he is showing signs of developing in to the perfect modern midfielder although given his relatively young age there are still rough edges that should be rounded off as he gains more experience. The real question will surely be whether Empoli can hold on to what is fast becoming their most valuable asset. The side from a small city just outside Florence have done well in recent seasons to cement a place as a respectable mid table Serie A side and can claim a certain amount of credit as the first top flight club to give current Napoli coach Maurizio Sarri his break in the top flight. Now the top sides are paying attention to the rise of the Senegalese youngster who is driving Empoli forward. Assane Diousse plays predominantly as the deepest midfielder for Empoli. His exact role differs depending on your point of view with some viewing him as purely a defensive midfielder while others point to his attacking contribution and ability to link play and see him as a controlling playmaker at the base of the midfield. In truth he is a combination of both and this makes him integral to the style of play for Empoli as they look to move out of the relative safety of mid table and make a run for European qualification. Here you can see Lazio attacking down their right hand flank and Empoli set up in a four man defensive structure. With Lazio set up with a lone striker the danger is coming from the man advancing in the central area and the player on the far side looking to access the space in front of the defensive line. Diousse is the only Empoli player in a position to cover the space in front of the defensive line and as the man in possession looks to cut inside to the central areas Diousse is the man that will move across to either challenge the central man if he takes possession of the ball or to engage the wide player cutting in to the central areas. This time in the match against Juventus we see Juve look to transition quickly from defence to attack playing the quick vertical pass in to the final third to try to catch the Empoli defensive structure out of position. As Juventus look to access the central space in front of the Empoli defence who are out of shape we can see Diousse using his pace and determination to get back in to a position to block off the central passing lanes that are open to Juventus. In situations such as these Diousse does not look to close the ball carrier down immediately. Instead he will get back in to his defensive position before looking to press and challenge for the ball when the defensive structure of his side is in a more settled and strong position. This showcases in part the ability of Diousse to play from box to box and to take part in both the defensive and attacking phases. As well as being intelligent in his defensive positioning and knowledge of space and angles Diousse is also strong in choosing the correct moment to step up and challenge the man in possession of the ball or step in front of a pass to cut it off before it reaches its intended target. Diousse uses his speed and physical strength to win defensive duels before shifting the ball off to a teammate in a stronger position to initiate the attacking transition. Here Juventus are attacking in an advanced area of the pitch and they are in position to score a relatively easy goal. The man in possession of the ball has rounded the Empoli goalkeeper and is about to shoot past the covering defender on the line. Instead Diousse showcases his speed over the short distance as he closes the man in possession down and challenges him cleanly in the box before shifting the ball off and starting the attacking transition. Here Genoa are attacking in the final third of the pitch and looking to access the central areas from the wide position. The defensive structure of the Empoli side is relatively strong but the ball is hooked first time in to an attacker in the central area. As the ball moves centrally Diousse is already moving across to shadow the attacking player who is looking to take possession of the ball. 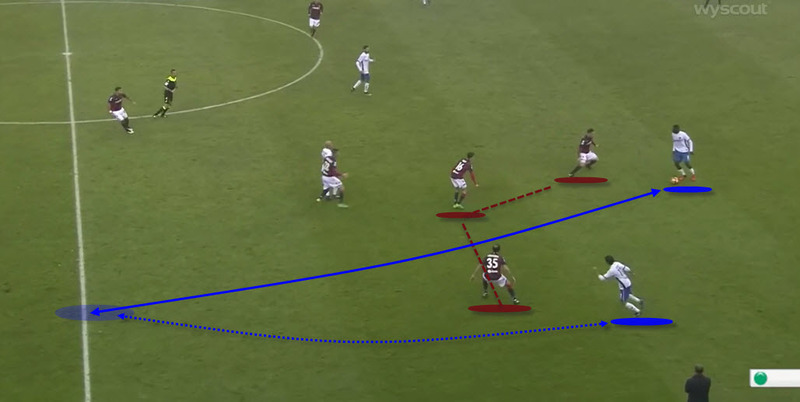 He reads the pass immediately and is able to get in front of the Genoa attacker taking possession of the ball and negating the attacking threat of the opposition. Here Genoa are again looking to attack and move forward in to the final third against Empoli. Empoli are having to transition from attack to defence and once again Diousse has been heavily involved in the attacking phase. As such he finds himself out of position as Genoa attack. The man in possession of the ball for Genoa looks to slide the ball through the lines for the man making a run in to an advanced position. Once again though Diousse shows his physical capacity to cover space and is able to get back to challenge and intercept the ball. As well as being solid defensively Diousse is also very strong in the attacking phase of the game with his ability to identify opportunities to play the ball through the defensive lines of the opposition. As well as passing the ball forward Diousse is strong in getting forward to support his team in the final third although his end product of the final pass or shot still leaves a lot to be desired. Here we see Diousse in possession of the ball against Juventus with the opposition in a relatively passive defensive structure. Instead of playing the ball laterally across the field or back towards his own goal Diousse is instead able to identify the space towards the final third for Empoli. He plays his pass through the defensive lines of Juventus in to the forward player who has moved to drop off in to a pocket of space. This pass allows Empoli to set and play from an advanced position. On this occasion Diousse has possession of the ball in his own half but he is coming under more significant pressure from the opposition. Instead of losing his composure in possession of the ball he is confident enough in his own abilities to pause in possession of the ball before playing the ball through the defensive structure in to the feet of the wide player who has made a delayed run beyond the pressure. This composure for such a young player is indicative of his quality as a leader of this young player. As Diousse gains more experience going forward he has the potential to become one of the strongest midfielders in European football. There is a definite move amongst clubs of Serie A to place their trust in younger players instead of maintaining their preference for experience throughout their squads. There is little doubt that players like Assane Diousse are showing the value of this shift in philosophy. With little by way of fear or respect for reputations the Senegalese youngster is controlling matches for the Tuscan side. As he continues to grow the question will be whether he will still be controlling the midfield in Tuscany or in Rome, Turin or Milan.